The Mary Celeste (or Marie Cèleste as it is fictionally referred to by Sir Arthur Conan Doyle and others after him) was a British-American merchant brigantine famous for having been discovered on 4 December 1872 in the Atlantic Ocean, unmanned and apparently abandoned (one lifeboat was missing, along with its crew of seven), although the weather was fine and her crew had been experienced and capable seamen. The Mary Celeste was in seaworthy condition and still under sail heading toward the Strait of Gibraltar. She had been at sea for a month and had over six months’ worth of food and water on board. Her cargo was virtually untouched and the crew’s personal belongings were still in place, including valuables. None of those on board were ever seen or heard from again, and their disappearance is often cited as the greatest maritime mystery of all time. 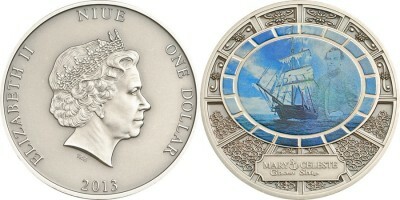 The question of why the crew left the Mary Celeste has been the subject of much speculation. Theories range from natural causes (alcohol fumes, underwater earthquakes, waterspouts) to human actions (piracy, mutiny, errors of judgment) to paranormal explanations (extraterrestrial life, unidentified flying objects (UFOs), sea monsters, and the Bermuda Triangle, although the ship is not known to have sailed through that area of the Atlantic). The Mary Celeste, with a history of misfortune, was said to be “cursed” even before she was discovered derelict with no apparent explanation, a classic ghost ship. 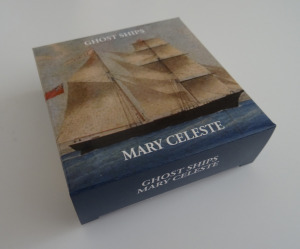 In 1885, the Mary Celeste was destroyed when her last owner intentionally wrecked her off the coast of Haiti in an attempt to commit insurance fraud. Other ships in the series include the Flying Dutchman and the Lady Lovibound.